Paradox Sport Omega 3-6-7-9 + vitamin D3 & E is an omega oil supplement formulated to provide optimum performance and recovery post-exercise. It is a fatty acid which may support general well-being of the cardiovascular system and for brain function. Over-training promotes inflammatory reactions in the muscle tissue, increasing the risk of injury and inflammation. Omega fish oil supplements have a higher level of protection from anti-inflammatory substances. Those who take part in an event that demands intense periods of focus and concentration will also gain benefit from the correct balance of omega fatty acids, as they make up a large part of the brain. Vitamin D may regulate with cell growth, immunity and cell metabolism which is recommended for those who participate in sporting event. Omega 3, 6, 7 & 9 may support general well-being of the cardiovascular system, the musculoskeletal system, mucosa, lungs and the brain. They may also decrease inflammation and aiding recovery as well as showing a positive effect on thermogenesis, insulin sensitivity, anabolism and reducing PG2s protaglandins. Pure fish oil, pure extra virgin olive oil, pure organic lemon oil, capsule: gelatine bp (Halal/Kosher), glycerol bp, lemon oil bp, maize starch, cellulose, yellow iron oxide, sucralose. Ages 12+: Take 1-2 capsules daily. 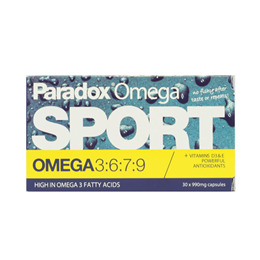 Below are reviews of Paradox Sport Omega 3-6-7-9 + Vitamin D3 & E - 30 Capsules by bodykind customers. If you have tried this product we'd love to hear what you think so please leave a review.